Many a times in any Linux/Unix based Operating Systems it is wise to understand the underlying concepts then only one can appreciate the beauty of commands and how they are implemented. Some small details will help us a lot in debugging and troubleshooting many challenging situations if we know well in advance about these commands and related concepts. In this topic, I will be covering what are links, different types, distinguishing characters and how they can be better used along with concepts required. By executing “man ln” command you can see that this says “make link between files” and doesn’t say about soft or hard links. Similarly the command “man link” describes as “call link function to create a file”. Soft link as the name suggests is a just a new link created to the new file. In this case the new file’s inode number will be pointing to the old file. In this case the old and new file both will be pointing to same inode number. 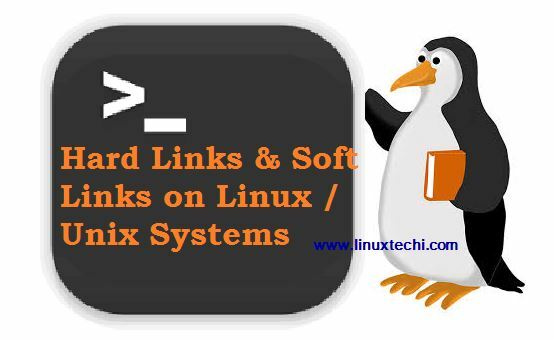 In some Unix/Linux flavors both the symbolic and soft links are treated as same. But actual difference is that both the inode numbers of new and old file will be pointing to a new inode number. This will be completely depending on the implementation. Note 1:- In many cases symbolic and soft link terminologies are used interchangeably. But one has to be aware of when to use what. 1) “man ln” command will provide the following output. 2) When “ln” command is passed without any arguments, “missing file operand” error is thrown. drwx------  4 root root 4096 Feb  6 15:23 .
drwxr-xr-x 23 root root 4096 Jan 25 16:39 ..
ii) Enter contents into the file using “cat” command, and hit “ctrl+c” to save and exit. iii) Create the hard link between the files “123.txt” and “321.txt”. In this case the “123.txt” already existed with contents “Welcome to this World”. iv) Check the inode(index node) numbers of the files. For both the files the inode number is same and which is 794583. Also check the contents of new file “321.txt” which is also same as “123.txt”. Note 2:- Inode number is a unique index number generated for any file that is being created in Linux/unix Operating systems. These inode numbers are stored in directory/file attributes in /proc directory. But in case of links these inode numbers are shared b/w the files and only path is updated in file table. v) Create one more file called “456.txt” and link this using ln command to “321.txt”. Now all the three files have the same inode numbers. Contents of “456.txt” will be as same as that of original file. vi) When the source file or any of these files are removed, it will not impact other files. The source file can be removed using “rm” command. Contents of other file will not have any impact either. vii) Hard link creation across directories is not allowed. 1) Create the file “src.txt” using “touch” command and enter contents as “Hello World” using cat command and then hit “ctrl+c” to save and exit. 2) Create the destination file as “dst.txt” and using “ln -s” command line options create the symbolic link (also called as soft link). Check the contents of “dst.txt” file and same contents as that of “src.txt” can be seen. 3) In case of symbolic links the inode number of source file and destination file differs. Also, in the permissions letter “l” appears indicating that these are links. “dst.txt–>src.txt” will be the new link established now. 6) Symbolic links can be created for directories as explained earlier. Once these directories with symbolic link are created, inside these directories files can be created. This will make it more interesting to know how this behaves now. When the files are created in the source directory, the same is reflected in destination directory as well. The following steps explains this clearly. [email protected] ~}$  cd .. Note 3:- We can have any number of nested links. But the user/admin who creates these symbolic links should be aware of the fact that these will lead to confusion. Sometimes may be forgotten and may create unwanted results. So they have to be careful. Note 4:- There are some possibilities of “symbolic” or “soft” link pointing to a non-existing link. This is called as “Dangling link”. This will be pointing to no-where. Note 5:- there are system calls used in linux/unix to create symbolic OR hard links at programming level (using system level C/C++ programs). These are 1) symlink 2) symlinkat. These should not be confused with command line utilities that I have described above. Creating links whether hard or soft will be very helpful for admins and developers. The above reference material will come handy while understanding what type of link we are creating and how it is helpful. Also this article will help in understanding the differences and utilization of links. There is an advice to add procedure to remove hard/soft links as well, for the sake of completeness of your article.